Harry, Ron, and Hermione battle the evil Voldemort as he grows even more powerful Made for potter fans for sure will adore everything about this movie. When Half-Blood Prince hit theaters last year die hard Potter fans screamed foul as the movie was missing huge portions of the book. They said that huge battles and crucial plot points were left out for inexplicable reasons. When making movies like this that refer to such beloved source material there’s always the danger that you’re not going to please everyone all of the time. Perhaps each book would have benefited from the two-part treatment. As a person that has not read all of the books, I can say that Deathly Hallows: Part 1 feels the most complete. “Half-Blood Prince” was lacking that final oomph to push it over the edge. It lacked any particular climax, and when I found out from avid readers that a large battle was left out, then I knew why. In The Deathly Hallows: Part 1 Harry and the gang are reeling after the death of Dumbledore. The wizarding world has been turned upside down, and Harry now finds himself in very real danger. Voldemort has amassed a great following and enough power that he can openly attack Harry Potter, which he does when Hagrid and a bunch of other friends of Potter try and move him to a safe location. A large battle is waged in the skies above England as wizards and witches on brooms try and fend off Voldemort’s Death Eaters. It’s all very exciting. Fans will be happy to know that the movie follows closely along with the book (at least that’s what my wife has told me). Yes, there is a lot of camping, which I know many people complained about after they read the book. To me though, the camping in necessary to help Harry, Hermione, and Ron grow and evolve as characters. Make no mistake this isn’t a movie for younger children. It’s dark and at times very frightening. It feels like a horror movie at times, especially when Harry and Hermione go and visit an old lady who used to be friends with Dumbledore. There’s not much more to say, other than David Yates really got this one right. I still have a problem with the movie in so much that there are a lot of places where it takes for granted that you’ve read the books. 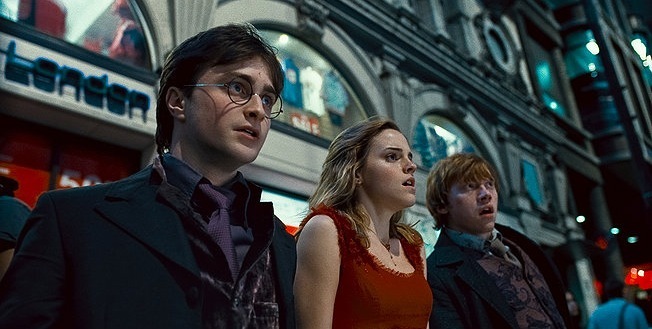 I found myself constantly asking, “Wait, who is that?” “What is Harry holding?” Why are they going there?” This is partly my fault for not having read the books, but partly the fault of the screenwriters for assuming that I have. Other than that, this is bar none the most enjoyable film of the entire series. It’s fraught with danger and destruction, and has done away with most of the doe-eyed teenage lovey-dovey stuff that almost ruined the last movie. Fans will be happy.